It's that time again where your bloglovin' feed or however you choose to view blog posts is going to get spammed with gift guides. 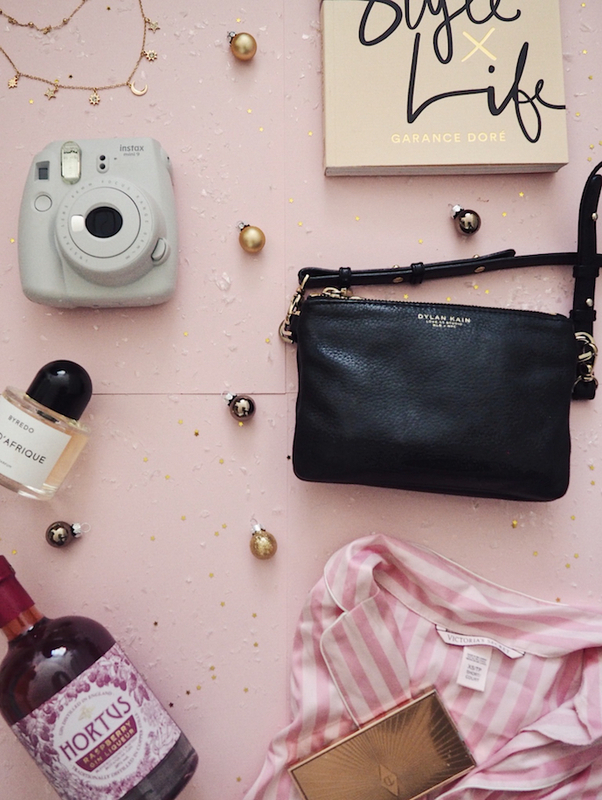 some may roll their eyes and continue to scroll past all gift guides, but if you're like me then you may enjoy the fact that this may make Christmas shopping easier or you just click on it because you want to see a pretty festive flatlay, I know I'm a sucker for a good flatlay. So here we go, for the first time I am bringing you five days of Christmas gift guides, let's hope after these five days you will have your shopping list completed! Now I get the most excited when it comes to creating a gift guide for her because it basically means I can create a flatlay of gifts that I'd probably be pretty happy receiving myself, so it's kinda like creating a gift guide for yourself to! Some of these gifts may seem a bit spendy on the ole' wallet, but I'm not saying you HAVE to go out and by those Victoria secret pyjamas, I'm merely saying that pyjamas are a great gift, whether they're from Primark or Victoria secrets I think any girl would be happy with a nice new pair of pjs because their is nothing better than after that Christmas roast having a shower and slipping into those brand new pyjamas, I love it and on that note, why not get them a bottle of their favourite beverage to sip away on during the day! This gin from Hortus is their raspberry edition they have bought out for Christmas at lidl and I cannot wait to open it! I am also on the hunt for the rhubarb and ginger one. A luxury gift, why not treat a girl you love to a bag they've been lusting over? Again it doesn't have to cost an arm and a leg, but a girl can never have too many bags and if like me they think a bag can dramatically change an outfit, well then you've practically bought them a new outfit but without having to actually get them a new outfit. On that note of changing an outfit, you can never ever go wrong with jewellery. I think any girl would be more than happy receiving jewellery, whether it be earrings, a necklace, a ring (just make sure she doesn't think you're proposing boyfriends haha) or a bracelet. It really is quite a safe option in my opinion. You could get something for your mum, sister, friend, aunt, nan, any girl would be happy and again they can help make someone feel they're outfit is completely different to. Just make sure you find out what kind of jewellery she prefers - i.e silver, gold, rose gold - that you could get wrong. I think nowadays lots of people enjoy taking photos, whether they upload to instagram or not people are always taking photos so why not take it back old school and treat someone to a instax, then it's ready for taking lots of fun new years eve photos and it's so easy to carry anywhere! I think a fragrance is a very good gift to give to, every girl pretty much wears perfume every day, but it's not usually something we go and get on the regular so being treated to a good scent is always very special, whether you just restock them with what they wear all the time or treat them to something new. Just try and get something you think they'll like. A good tip, find out what makes up the perfumes they already have, make a note of the notes an scents that pop up regular in their perfumes and then go with that. For example a lot of my perfumes have vanilla, amber, woody, juniper and subtle hints of floral, so I would hope that any perfume would have some of these notes as that is the kind of thing I like. Similar make up could be a good one, I'm sure most girls have a make up wish list and it's always good to help keep their stock a plenty, just make sure you know their shades and things. There you have it, my first Christmas gift guid instalment, stay tuned for day 2!